Looking for videos, worksheets, stories and songs to help Grade 6 students learn about integers? The following figure shows an integer number line. Scroll down the page for examples and solutions. When comparing and ordering numbers, we should refer to a number line and look at the position of the number on the line in relation to 0 to determine its value.Any number to the right is always greater than any number to the left. This applies to both positive and negative integers. 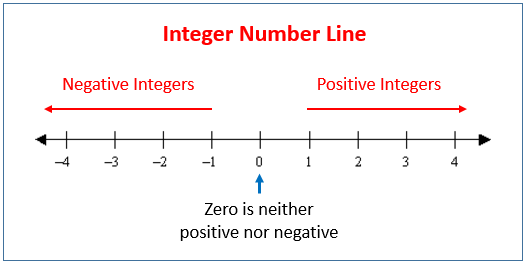 When placing integers on a number line, we first look at the sign to see whether it is a positive or negative number. Then we look at the digit to determine how far away from 0 the number should go. All negative numbers are less than 0 and placed to the left of the 0 on the number line. How to locate and plot integers on a number line? Identify which of the following are integers and plot them on the number line. Learn to represent and compare integers on a number line. 1. To what number is the arrow pointing? 2. What is the opposite of -80°F ? 3. Compare, write > or <. Use a number line to solve. 1. Graph -3 on the number line. 2. Use <, > or = to make a true sentence. Use a number line to compare. 3. Estimate the values for the points A to G and order the points from the least to the greatest. Write the following integers from the least to the greatest. Arrange the following integers from the least to the greatest. How to order integers on the number line and review the definitions of absolute value and opposites? Opposites are two numbers that are the same distance from zero, but on the opposite side of zero on the number line. Identify each number in the left column with its opposite in the right column.